Anyone who has followed the Syria war in any detail, even from a secure distance in the UK, will have seen things they would rather not have seen. Photographs of tortured, starved, lacerated, or burned bodies; images of children with limbs gone, or jaws half blown off, or heads completely blown off. For me, the presence in memory of these indelible images made the thought of watching Assad calmly answering questions on the BBC as unsettling a prospect as watching a YouTube clip of the aftermath of a marketplace bombing. We know the routine by now: a book-lined office signalling a stable, secular, civilised, Western-friendly leader. A good suit signalling a man we can do business with. And then deny everything. Deny the Human Rights Watch reports, the UN reports on barrel bombs, on chemical weapons, on the blocking of food aid, on the blocking of medical aid. Deny every single thing. Obama’s miserable “fantasy” comment, made in contradiction to his own declared policy, should shame him as it is spewed back from Assad’s mouth. It should shame Obama just as should his narrow intervention against ISIS when Assad is the party that continues to be by far the biggest killer of Syrian civilians. In this interview Assad has once again shown himself to be incapable of any acknowledgement of responsibility, of any recognition of reality. He is not someone the West can do business with. The greatest fantasy on Syria has been the hope that diplomacy could trump force. This war can’t end as long as Assad is allowed the means to slaughter at will. On the 22nd of this month it will be three years since journalists Marie Colvin and Rémi Ochlik were killed by Syrian regime shelling in the siege of Baba Amr, Homs. According to fellow journalist Paul Conroy, severely injured in the same attack, the media centre they were staying in was deliberately targeted by Assad’s forces bracketing their shellfire in order to achieve a direct hit. And on the 22nd it will also be one year since the UN Security Council passed Resolution 2139, which demanded amongst other things an end to sieges of civilian areas, an end to shelling of civilian areas, and an end to air attacks on civilian areas, including an end to barrel bombing. Every 30 days since the passing of UNSCR 2139, the Secretary General has been required to report to the Security Council on compliance. Every report has listed ongoing sieges, ongoing shelling of civilians, ongoing air attacks on civilians. UNSCR 2139 ended with the Security Council expressing “its intent to take further steps in the case of non-compliance with this resolution.” Since then Russia has made clear it will block any substantial measures to enforce compliance. The Security Council is in a similar position as it was over Kosovo in 1999, having made demands but being unable to pass a vote for enforcement of those demands. One year on from the passing of that resolution, individual permanent members of the Security Council now need to recognise that there is no prospect of a diplomatic solution with Assad. Consequently there is no prospect of relief for civilians unless they follow the Kosovo precedent and take responsibility to enforce Resolution 2139. 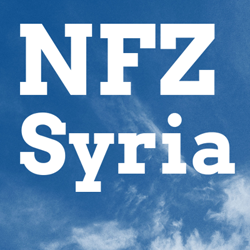 The Violations Documentation Center in Syria now lists 25,428 civilians killed since the 29 August 2013 UK Parliament vote against intervention. 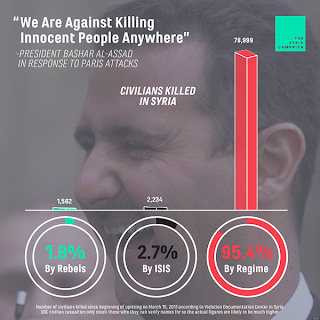 This total includes 234 civilians killed by rebels listed under ‘Regime’ casualties. 25,194 are listed under ‘Martyrs’, a figure which includes 165 killed by US-led Coalition air strikes, leaving 25,029 civilians killed by the regime or others. If the VDC figure for civilians killed since the 2013 vote were found to be an undercount to the same degree, then the actual figure would be over 44,400 civilians killed since the UK Parliament rejected intervention. 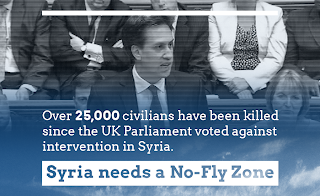 Amongst the 25,428 civilians VDC Syria confirmed killed since the UK vote are 9,557 people killed by air attacks. 165 of them were killed by US-led strikes, and 9,392 were killed by Assad’s air force. 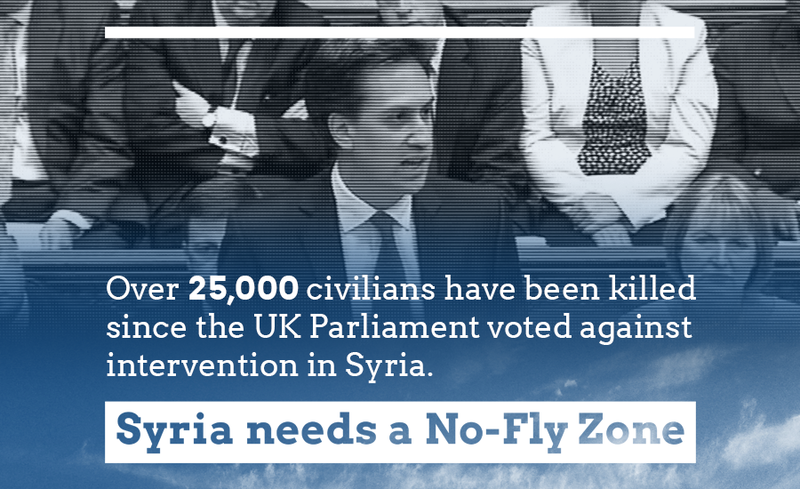 That means at least 36% of all civilians confirmed killed since the vote could have been saved by a No-Fly Zone. Again, the confirmed number is certainly an undercount, possibly by thousands. UNHCR numbers for registered refugees are also lower than the actual number of people believed to have fled Syria. When the UK Parliament debated intervention on the 29th of August 2013 the number of registered Syrian refugees was 1,830,557. The current number of registered refugees is 3,726,884, over twice as many, but the true number will be higher still. Air attacks by the regime are a key driver of refugee flows: see Barrel Bombs: A tool to force displacement in Eastern Aleppo by Ryan O’Farrell, and the March 2014 Human Rights Watch report, Unlawful Air Attacks Terrorize Aleppo. This month will see the first anniversary of UN Security Council Resolution 2139 which demanded an end to air attacks on civilian areas, amongst other things. It has not been enforced. In giving these numbers, I am trying to demonstrate the scale of the consequences of the decisions made by MPs in August 2013. I have not shown graphic images of the butchery that continues every day, but you should remember that these are not peaceful deaths, eased by painkillers in quiet hospital beds. And for every body fatally ripped apart there are untold others maimed for life. And they all have names, or had them once. 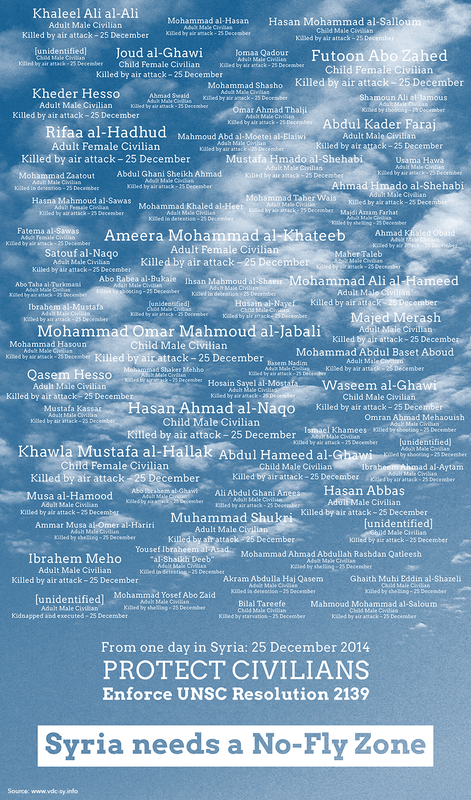 Below are the confirmed killed for one day, 25 December 2014. With the murder of journalist Kenji Goto, ISIS again demonstrated their carefully packaged and branded approach to terrorism, from logo to costumes, from the attention-grabbing trailing of their murders to their ‘please share’ death videos, they present perhaps the most compelling integration of marketing and political violence since the Nazis. They are the perfect terrorists from Central Casting. But while ISIS flaunt their brutality, the greatest threat to Syrians, and consequently the greatest threat to regional stability and to European security, remains the Assad regime. In December, the Assad regime was responsible for three-quarters of all violent deaths recorded by the Syrian Network for Human Rights. 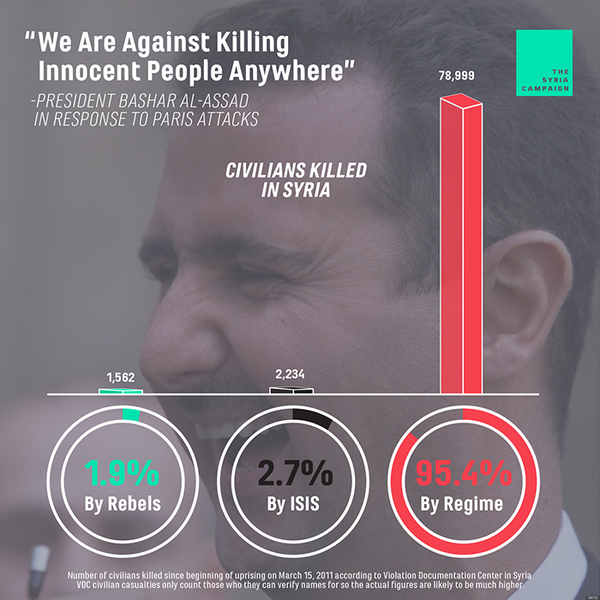 Amongst civilians the proportion was even higher: over 85% of civilians killed in December were victims of the Assad regime. The Regime is responsible for over 95% of all civilian violent deaths recorded by the Violations Documentation Center in Syria since March 2011. According to VDC figures, in the last year in the province of Raqqa, stronghold of ISIS, over seven times as many civilians were confirmed killed by Assad air strikes as were killed by ISIS. Like ISIS, Assad also has a marketing strategy. Unlike ISIS, his strategy is not to flaunt his brutality, at least when dealing with the wider world beyond Syria. From before ISIS appeared, from the very start of peaceful protests against his dictatorship in 2011, he has claimed that all of his opponents are terrorists and has sought to portray himself as the opposite: a civilised leader in a Western businessman’s suit and tie. The contrast between his costume and those of ISIS is perfect… almost too perfect. For years there have been allegations from former insiders that the Assad regime deliberately brought about the rise of ISIS: from Nawaf Fares, former Syrian ambassador to Iraq; from Mohammed Habash, former member of the Syrian parliament; from Bassam Barabandi, former Syrian diplomat; from a former member of Syria’s Military Intelligence Directorate. The regime had a known history of facilitating their earlier incarnation, Al Qaeda in Iraq, and there is objective evidence that the regime avoided conflict with ISIS as they took over territory from the Free Syrian Army and associated rebel groups. Despite this, Assad’s marketing of himself as a force to counter terrorism has had an unreasonable degree of success. It’s sadly no longer surprising when Patrick Cockburn in the Independent pitches the topsy-turvy notion that keeping Assad might help counter terrorism, nor when we see it coming from Leslie Gelb writing for the Daily Beast website – he has pushed this line before. The disturbing thing is that Gelb now claims anonymous sources in the Obama administration are telling him that Obama also buys this line. Seeing it echoed in a New York Times editorial makes it even more unsettling as the New York Times editorial board has for some time been a prime target of Obama administration PR efforts. For more on reactions to this, see Akbar Shahid Ahmed’s report, Springtime for Assad. But behind the cheery aphorisms and the barely-there mustache is a man so unyielding and deeply deceptive — or delusional — that it’s impossible to imagine him ever negotiating an equitable end to Syria’s civil war. Either Syria’s president is an extremely competent fabulist — in which case he’s merely a sociopath — or he actually believes his lies, in which case he’s something much more dangerous (like a delusional psychopath). Read the rest, or listen to Jonathan Tepperman describe his experience in the video below. An end to Syria’s war requires an end to Assad, and an end to ISIS requires the same. Obama’s current ISIS-only strategy in Syria fails on both counts. The least the US-led coalition against ISIS should do is to make protection of civilians the priority: stop air attacks by Assad, the enabler of ISIS, and give the parts of Syria outside of Assad and ISIS control some chance of peace and stability.